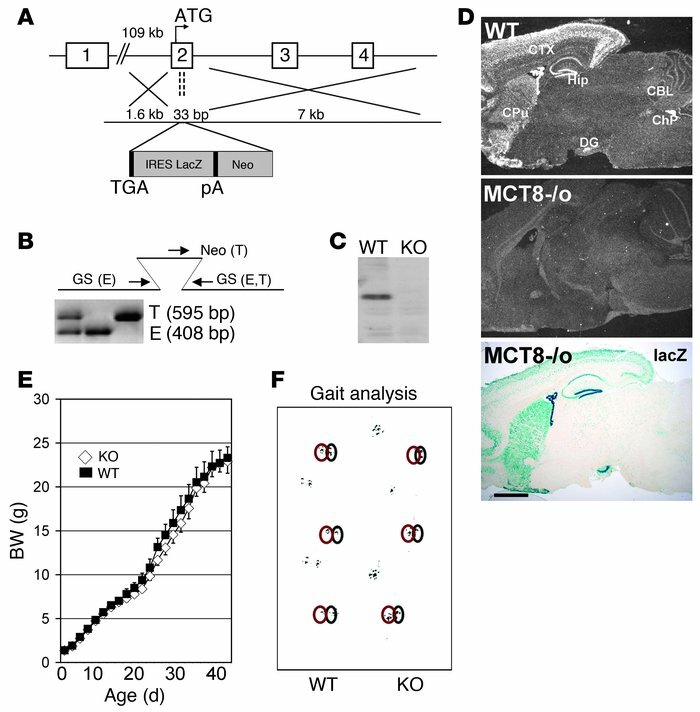 Generation and analysis of MCT8-null mice. (A) Targeting strategy for the MCT8-knockout mouse. As described in Methods, 33 bp of exon 2 were replaced by a lacZ/neomycin reporter cassette. pA, polyadenylation signal; TGA, stop codon. (B) Homologous recombination was confirmed by PCR analysis using 3 primers recognizing the endogenous (E) and the targeted (T) allele as indicated and described in Methods. GS, gene-specific primer; Neo, neomycin cassette–specific primer. (C) Absence of MCT8 protein in MCT8-deficient animals was demonstrated by Western blot analysis of liver homogenates. (D) Deletion of the MCT8 gene was further confirmed by radioactive ISH demonstrating that MCT8 mRNA expression in sagittal brain sections of wild-type animals is completely diminished in sections derived from MCT8-null mice. Deletion of the MCT8 gene was also demonstrated by the expression of lacZ in MCT8–/o animals. CBL, cerebellum; ChP, choroid plexus; CPu, caudate-putamen; CTX, cerebral cortex; DG, dentate gyrus; Hip, hippocampus. Scale bar in D: 1.5 mm. (E) MCT8-null mice develop normally, as indicated by the growth curve. (F) Gait analysis did not reveal any signs of ataxia.